California Gov. Jerry Brown Signs New Climate Change Laws : The Two-Way Brown signed two laws designed to be the most ambitious initiative on climate change in the country. The business community says the laws don't consider the economic impact on the state. California State Sen. Fran Pavley, D-Agoura Hills, holds a bill signed by Gov. Jerry Brown, setting a new goal to reduce greenhouse gas emissions 40 percent below 1990 levels by 2030. California is already on track to drastically reduce greenhouse gas emissions to 1990 levels by 2020. Now under legislation signed by Gov. Jerry Brown, a Democrat, the state will ratchet up its fight against climate change by launching an ambitious campaign to scale back emissions 40 percent below 1990 levels by 2030. "This is big, and I hope it sends a message across the country," Brown said. California reduced emissions by imposing limits on the carbon content of gasoline and diesel fuel, promoting zero-emission electric vehicles, and introducing a cap-and-trade system for polluters. The new plan, outlined in SB32, involves increasing renewable energy use, putting more electric cars on the road, improving energy efficiency, and curbing emissions from key industries. Brown signed another bill, AB197, that gives lawmakers more oversight of regulators and provides aid to low-income or minority communities located near polluting facilities such as oil refineries and factories. California's crusade against climate change started under former Republican Gov. Arnold Schwarzenegger, who signed the state's original emissions-control law, known as AB32. "Here we are, 10 years later, emissions have gone down and the economy has gone up," said Sen. Fran Pavley (D-Agoura Hills), who wrote AB32 as well as SB32. "It's a success story." But not everyone agrees. 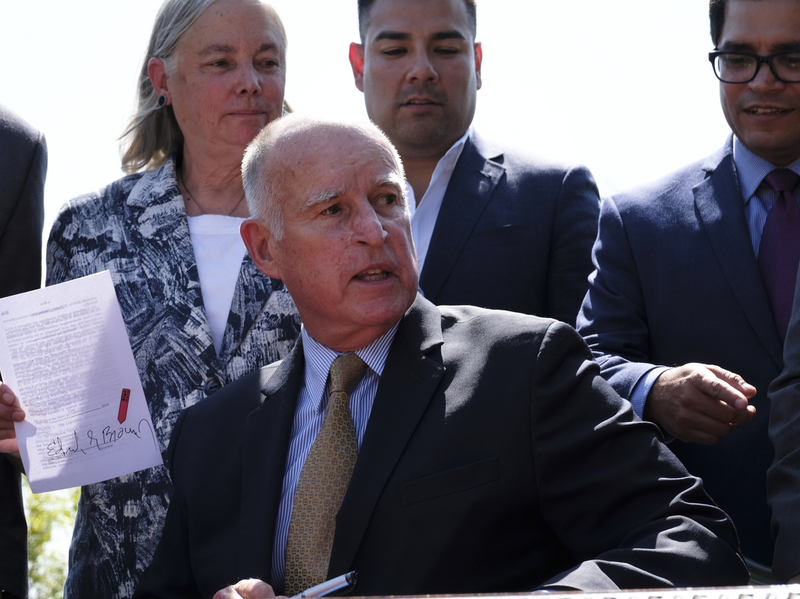 The two new laws signed by Brown faced fierce opposition from the state's business community, including the oil industry, as well as from Republicans. In a statement, California Chamber of Commerce President and CEO Allan Zaremberg said, "Taken together, SB32 and AB197, impose severe caps on the emission of greenhouse gases in California, without requiring the regulatory agencies to give any consideration to the impacts on our economy, disruptions in everyone's daily lives or the fact that California's population will grow almost 50 percent between 1990 and 2030." Brown noted at the signing ceremony that opponents are not going away. The San Francisco Chronicle carried this quote: "There's powerful opposition," Brown said. "These are real people with real bucks and real influence." The fight against climate change faces other hurdles. Revenue from the state's cap-and-trade system is falling. That program allows companies to buy permits to pollute at auctions; the money is then spent to reduce greenhouse gas emissions. There are concerns about the program's long-term viability.